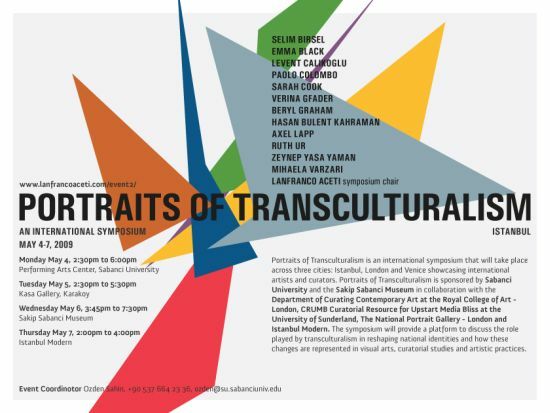 Portraits of Transculturalism is an international symposium that will take place across three cities: Istanbul, London and Venice showcasing international artists and curators. Portraits of Transculturalism is sponsored by Sabanci University and the Sakip Sabanci Museum in collaboration with the Department of Curating Contemporary Art at the Royal College of Art - London, CRUMB Curatorial Resource for Upstart Media Bliss at the University of Sunderland, The National Portrait Gallery - London and Istanbul Modern. The symposium will provide a platform to discuss the role played by transculturalism in reshaping national identities and how these changes are represented in visual arts, curatorial studies and artistic practices. For more information please visit the symposium's web site.